While it’s true that there are a number of options for the replacement of a missing tooth, none comes close to the natural appearance and functionality of dental implants. Our Dentists can assist with all your dental implant needs. Whether you need a single implant, two or more implants, or ‘teeth in a day dental implants’, we fit affordable dental implants that meet your needs, requirements, and budget. If you don’t already know implant-based restorations are regarded as the best way to replace missing teeth. Unlike conventional bridges and dentures, implants are anchored directly into the jaw bone where the missing tooth once was. Because implants are made from titanium, any remaining bone tissue fuses with it over time to create a super strong platform. This platform can then be used to hold a single crown or support a bridge or removable dentures. For this reason, dental implants are not only considerably stronger than other tooth replacement options, but they are also longer lasting with a typical restoration lasting 20-30 years. Now for the scary bit… or maybe not! For some people the thought of having a small titanium rod implanted into their jaw is enough to make them want to turn around and run for the hills. But in truth, the dental implant procedure itself is quick, easy, and most importantly with minimal pain. In fact, because we practice gentle dentistry, and with the aid of a small dose of a local anaesthetic, patients won’t feel a thing. Aside from that, the hardest part of the procedure (calculating the right trajectory and depth in which to place the implant) is carried out during the planning stages, without you even being involved. As a result, the surgical part of the process really is over before you know it. That’s all well and good but what to expect after dental implant surgery? For most people recovery is a relatively quick process. In some cases, patients with a single dental implant and no other complications have been known to return to work after just one or two days. Alternatively for patients facing more invasive surgery then recovery could take a little longer. However, on the whole, patients can normally expect to feel their normal selves within 7-10 days. Any pain felt is normally brought easily under control using over-the-counter painkillers, and sometimes prescribed antibiotics. Don’t worry because our highly skilled team will explain what you can expect post-surgery and what you should do to feel as comfortable as possible. Aside from needing time to recover physically, the surrounding bone tissue needs time to fuse with the implant. Typically this takes somewhere between 2-3 months for the lower jawbone and 3-6 months for the upper jawbone but during this time you should be good to carry on with your normal daily life. If you have had ‘teeth in a day’ dental implants, then apart from attending regular check-up’s to monitor your progress, then that’s it – your treatment’s over! However, if you’re having conventional dental implants, then you’ll need a tiny bit more surgery to fit the abutment. 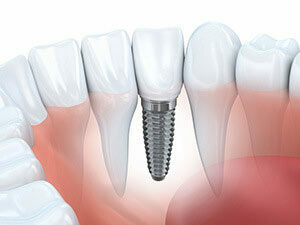 The implant is simply uncovered from the gum to expose the titanium base and the abutment placed on top. The abutment acts as a shock absorber which takes the weight of any bite and dissipates it down through the implant and out into the jaw. It’s a small but highly important piece of the implant. Then usually 2-3 weeks after this point, your permanent dental crown is fixed to complete the look. Perhaps the best thing about undergoing an implant-based restoration is that after roughly 4-9 months you have a lifelike replacement for a natural tooth. One which you can use for biting and chewing just as you would with your natural teeth. This allows you to eat whatever you like rather than only the foods that your previous oral situation allowed. All that said, if you want to avoid dental implant complications and have your implants last for the rest of your life, then it’s important to maintain daily brushing, flossing, and regular visits to your dentist in Cranbourne. Remember this is a commitment for life, so oral aftercare should be regular, thorough, and ongoing. As you can see, dental implants have the ability to restore a youthful appearance, boost confidence, and aid overall health. And let’s face it, there isn’t any other type of tooth replacement that even comes close! So if you’re weighing up your missing tooth options and would like to talk to us about undergoing dental implants, give us a call on (03) 5995 3819 or fill in the online booking form for a free initial consultation.